1. Rinse the cranberries and place in a pan. 2. Add remaining fruit filling ingredients and cook over medium heat until the berries start to pop. Cook 5 minutes, then cool. 3. Preheat oven to 400 degrees Fahrenheit. Line a baking sheet with parchment paper. 4. 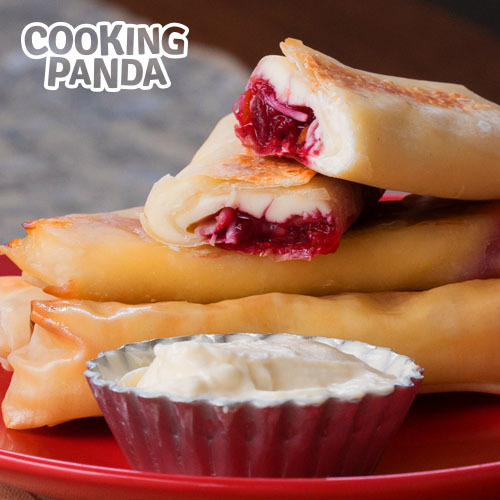 Place a cheese stick about 1 inch from the edge of an egg roll wrapper and scoop a small line of fruit filling next to the cheese, leaving distance from the edges to avoid overfilling. Gently wet the sides, fold in and roll up. Place seam-side down on baking sheet. Repeat with remaining mozzarella sticks and egg roll wrappers. 5. Spray wrapped cheese sticks with cooking spray or gently brush with oil. Bake for 10 minutes or until crispy and golden brown. Remove from oven and let cool. 6. Whip the cream cheese in a mixing bowl and gradually add the honey until it's light and fluffy. Serve and enjoy!